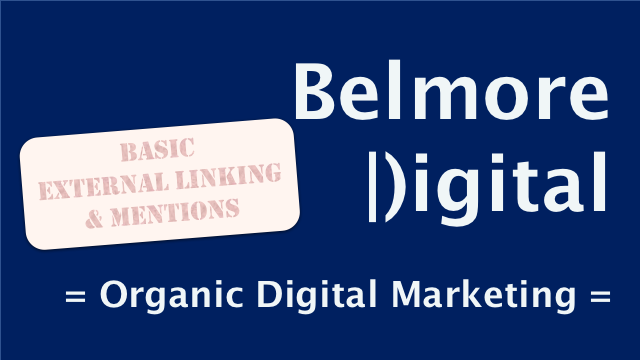 Basic link building and generating external links to a website are the lifeblood of the internet, with mentions a close second. Building links and giving links is key to any website’s organic reach, demonstration of expertise and acquisition of authority. This guide will introduce the basic concepts and first steps in building links, linking out to external sites and web mentions. External links act as references to your website. They may be seen as a vote of confidence, or a note of dissent. They may use keywords, related terms, images, or generic text. They may link to your homepage, or to an interior page. Ideally, they will come as a result of good quality content, being linked to from a similar expert in the same field, and they will be organic and editorial in nature. Links should be editorial rather than as part of a trade of some kind. Places where your competitors are linked should be opportunities for being linked as well. Use social media channels to actively share your content & links. These do not count for a great deal (nothing if the linking URL is not available to search engine robots), but they are a good way of getting the word out about your site. Don’t ask for, or demand, links. Don’t ask for links structured in a specific way, using specific text – especially exact match keyword text. Unless someone is deliberately targeting your website with negative SEO, don’t request removal of links – there are better things to be doing. That’s a lot of don’ts, mainly because generating links comes about as a result of having a good website, with good content, being promoted properly, and from building relationships with other online entities. Contextual deep links to interior pages from on-topic external authority pages are always preferable to any other type of links. Avoid overly-aggressive “link-building”. Over time the value decreases and non-editorial links are always at risk of an algorithmic penalty. Web mentions are unlinked mentions of your domain, or references to your brand – providing it is recognisable as such. Web mentions play a part in building references to your site and building contextual authority in specific areas. Web mentions are always opportunities to be converted into links. There is some school of thought that no-followed links are effectively web mentions. It’s pretty difficult to generate web mentions any way other than organically / editorially. Web mentions, like links, are a function of content quality, website quality, website relationships, so focus on those items rather than generating mentions. If you spot a web mention then there is always an opportunity to convert it into an editorial link. External linking is a way for you to reference other good sources of relevant information, and build your own expertise and authority. It’s natural to link out to other websites. Linking out encourages other people to link to you. No man is an island. Linking out to other relevant content can help the user to answer their query, or research further information. Place links on your website and pages to other reliable sources of information relevant to your topic. Only use nofollow if you do not trust the source of the information – in which case why are you linking to them? Use keywords, related terms, or generics naturally. Don’t be afraid of linking to other websites using keywords related to your topic. Place links in body content, or as separate “more info” / sources type links. Always give links for editorial reasons. Don’t give them for trade or exchange reasons.